The Redemptorists » Congratulations to our Neumann Essay Contest winners! 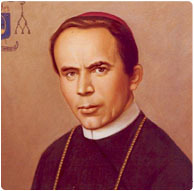 Happy Birthday, St. John Neumann! Today, we are blessed to remember the life and example of our brother, St. John Neumann. To celebrate the 200th birthday of Philadelphia’s “little bishop,” students from more than 100 archdiocesan Catholic schools will gather at the Neumann Shrine today at 10 a.m. for a prayer service. Click here to watch the prayer service live online! At the conclusion, the Redemptorists will announce the winners of our nationwide essay contest. The contest was one of several events organized for the Neumann Year, which will end in June 2012. We received an overwhelming response — more than 2,000 essays from across the country! We asked students in grades six through twelve to explain how St. John Neumann’s legacy has made Catholic schools the good news in education. The thoughtfulness and scholarship found in these essays speaks volumes of our saint’s lasting impact.